How fast does the eye send messages to the brain and the brain send messages to your hand muscles to react in time to catch a falling object? Find out using the ruler test! The reaction time chart and graph are available in the Materials & Directions PDF if you have not already downloaded it. Ask student to create a testable question (a hypothesis). Example: Do people of different ages have different reaction times? Stand over the test subject with your arm stretched out, holding the ruler with your thumb and forefinger. Put the beginning (end that starts with zero) of the ruler right between the test subject's open fingers. Without telling the test subject that you're going to do it, drop the ruler and the test subject catches it as quickly as they can between their fingers. Measure the distance on the ruler by recording where the test subject grabbed it. Using the reaction time chart, convert the distance to reaction time. Use the Reaction time graph to graph your data to measure trends. Change different variables to see what might cause reaction time to be faster or slower. Would having a warning about the when the ruler will drop change how quickly the catcher responds? Yes! 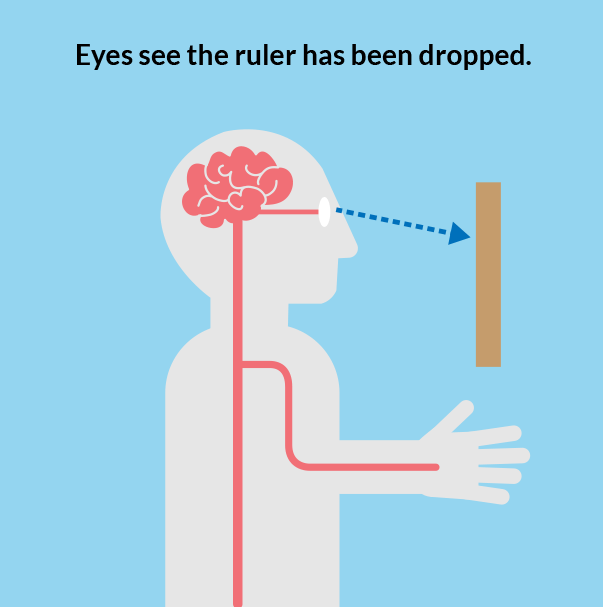 Our brains will be able to anticipate when the ruler will drop and can start sending the signal to the hand to catch it before the eye sees the ruler fall. Are you able to improve your reaction time? Practicing a skill over and over again will generally make us more efficient at performing that skill. Test it out with your experiment and see if people get faster over time. If the ruler falls farther, does that mean the catcher has slower or faster reaction time? Usually slower, but might depend on other factors. How did the response time change as you progressed through the ten trials? Does practicing the ruler drop improve reaction time? Why or why not? Yes, over time you can improve your abilities on any skill. Does using your right hand vs. left hand alter your reaction time? Why or why not? Yes, your dominant hand tends to be faster. What are some possible ways you could improve the experiment design? Answers depend on the scientist. Reaction time is the time between any kind of event and the response it elicits in a system. The brain is an essential part of developing a quick reaction time. In this experiment, the eye sees that the ruler has been dropped. This information travels from sensory neurons along the optic nerve from the eye to the brain. 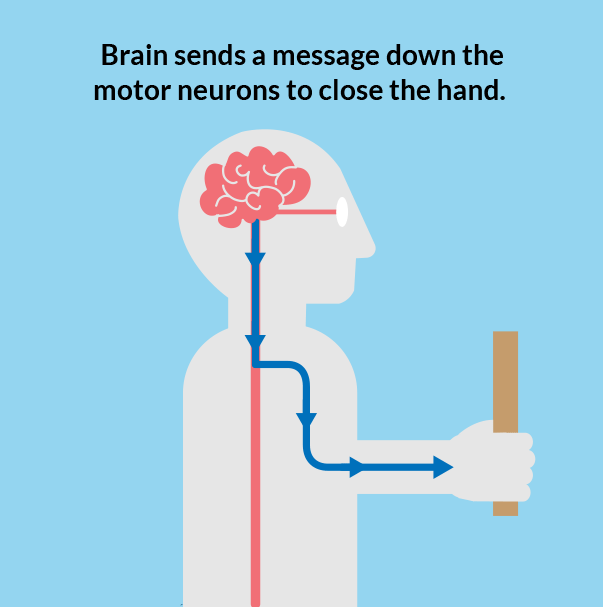 The brain processes this information, then sends a signal through motor neurons down the arm to tell the muscles in the hand to close and catch the ruler. The amount of time this all takes is what makes up our reaction time. Your reaction time depends on your eyesight and the speed that the signals take to travel from your brain to your muscles. It is possible to improve your reaction time via practice. When we begin to acquire a new physical skill through repetition, our nervous system creates new neural pathways. The more we practice something, the more the members of that neural pathway (eye, brain, muscles) become more well-connected and efficient. This is often referred to as muscle memory. 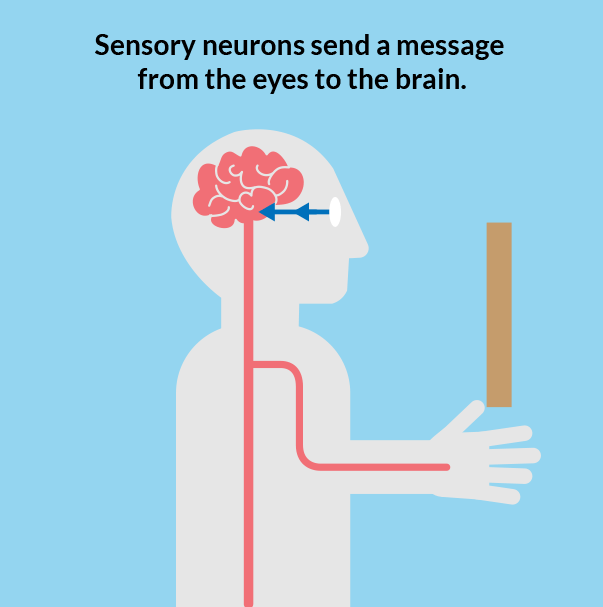 Sends information from sensory receptors (e.g., in skin, eyes, nose, tongue, ears) TOWARD the central nervous system and ultimately the brain. Sends information between sensory neurons and motor neurons. Most interneurons are located in the central nervous system. Send information AWAY from the central nervous system to muscles or glands. The cranial nerve that serves the retina - what connects your brain to your eye. The nervous system is the highway along which your brain sends and receives information about what is happening in the body and around it.